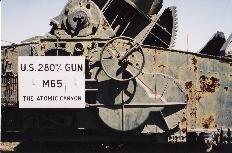 Click on the links below to see other websites concerning the Atomic Cannon. This website contains memoirs, anecdotes, photos and other items provided by U.S. Army veterans whom served in Atomic Cannon units in West Germany. Once in this site, look for links mentioning "280mm." This link takes you to the Atomic Cannon page of the Global Security.org site on world weapons technology. This link takes you to Wikipedia's entry on the Atomic Cannon. Sam Berliner's vast and remarkable site contains this page of images, text and anecdotes concerning The Atomic Cannon. Once the page opens, scroll down until you find the links to his Atomic Cannon pages. Well worth visiting. Addendum 2015: Sam's site has information about the 280mm cannon's predecessor, the 240mm gun, and about the "baby" Atomic Cannon, the 175mm. Check it out. 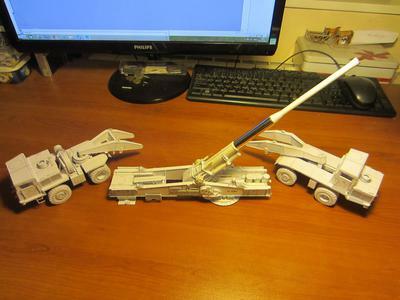 Once the site has loaded, open the folder named "Construction articles" and then open "Atomic Cannon". This link takes you to a online Games site with a really fun, downloadable video game called "Atomic Cannon." 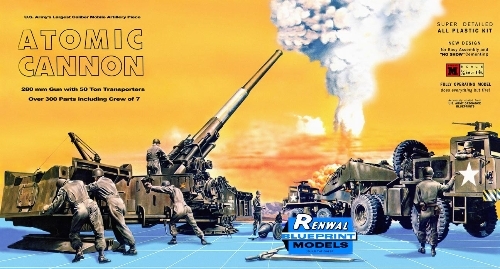 This site is dedicated to collecting, restoring and celebrating classic plastic model assembly kit box art; well worth registering to see the box art. 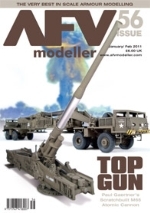 This link will take you to the AFV Modeller magazine site, where you can navigate to the page "AFV Back Issues." Unfortunately, issue 56 seems to be sold out.